These easy glazed lemon scones are a simple and delicious dessert for breakfast, Easter brunch, bridal shower, or a ladies tea party. 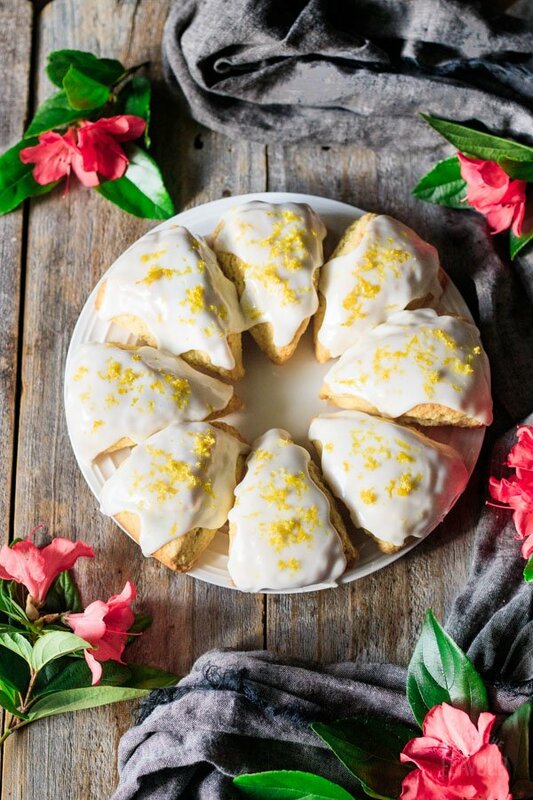 Each scone is topped with a tangy lemon glaze and a sprinkle of lemon zest for a casual yet elegant finish. Both kids and adults will love them! This post was originally published on March 22, 2018. Isn’t lemon one of the most wonderful flavors of spring? Just the aroma of lemon is so refreshing! 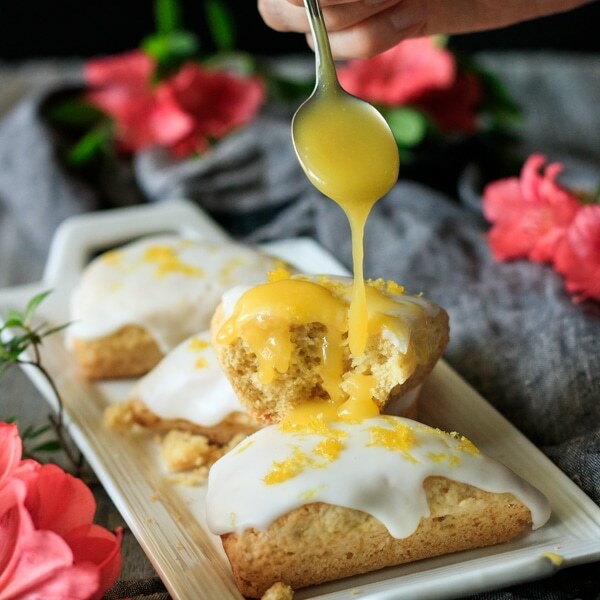 🍋 To satisfy your lemon cravings this spring, let me show you how to make some glazed lemon scones. What are scones made of? 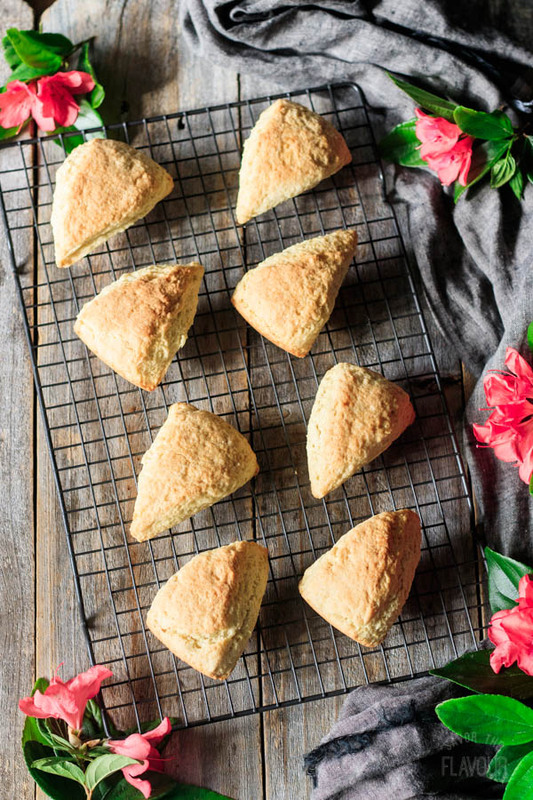 Scones are biscuit-like creations made of flour, salt, butter, milk, and baking powder. Often, sugar or eggs are added for a richer flavor, and the top is glazed with beaten egg before baking. In England, there is a debate about the correct pronunciation of the word “scone.” About half of Britons pronounce it rhyming with “gone,” while most of the others say it as rhyming with “bone.” Most Americans take the “bone” approach, but either one is correct. What is the difference between a biscuit and a scone? Although biscuits and scones look very similar and are made from the same ingredients, they are not the same. Biscuits should be sturdy and flaky, while scones should be slightly drier and more crumbly. Scones are meant to be split in half and filled with clotted cream, jam, curd, or butter, which brings added moisture and flavor. Do scones have eggs in them? Not all scones have eggs in them. I like to add an egg to my lemon scones for richness and flavor. Can you bake scones the day before? Baked scones taste the best the same day that they’re made. 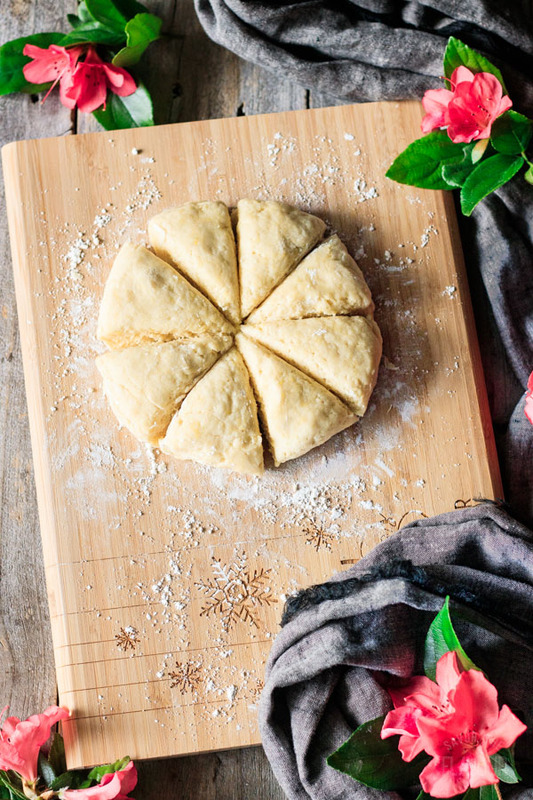 If you want to make scones in advance, mix up the dough the night before and store the dough in the fridge. Bake the scones fresh the next day. 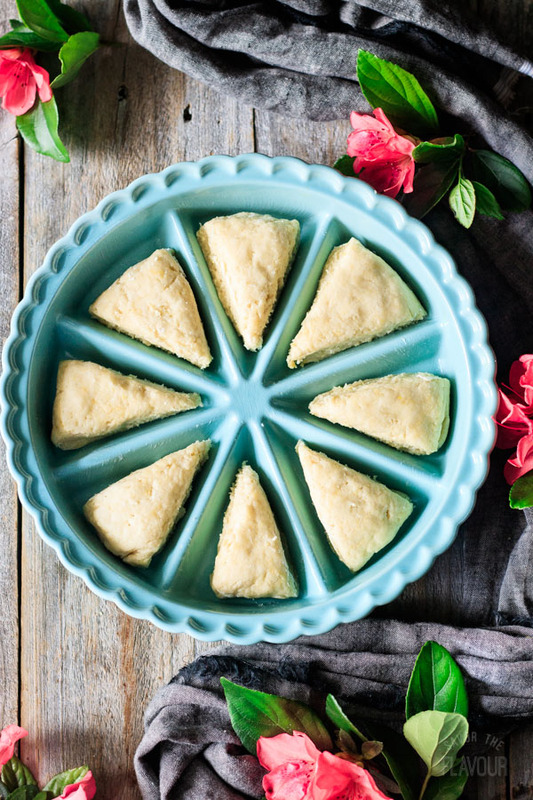 Can you freeze lemon scones? 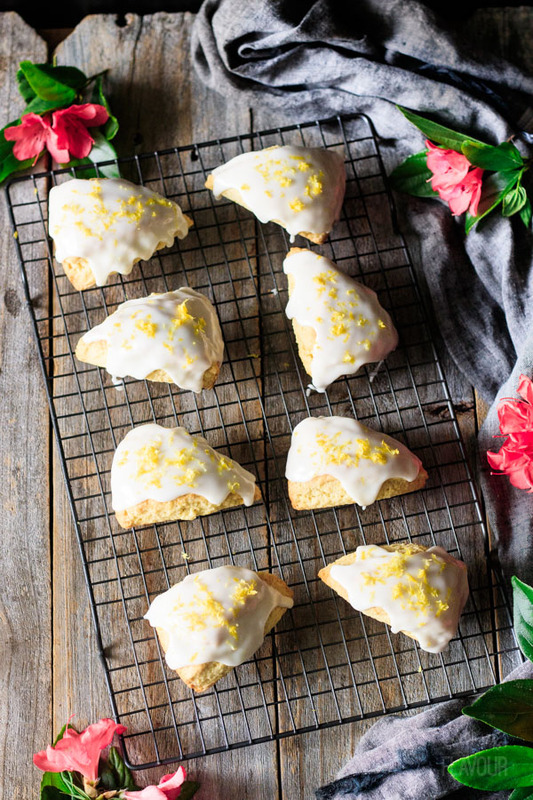 Yes, you can freeze baked lemon scones. Seal them tightly in an airtight container or zip-top freezer bag and freeze for 1 month. Defrost in the microwave or at room temperature. 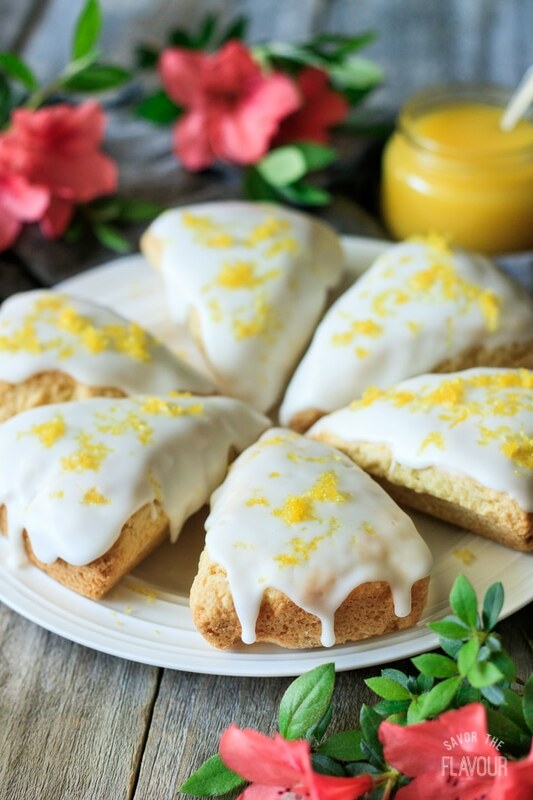 How do you make lemon scones? Gather the ingredients. Cube up the cold butter. 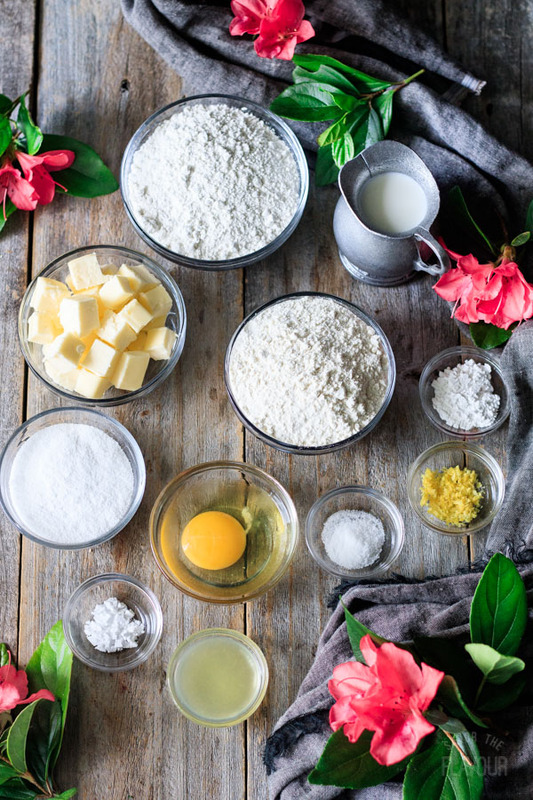 Whisk the flour, lemon zest, and other dry ingredients together until blended. Add the cold, cubed butter and rub it into the flour until the mixture resembles breadcrumbs. Add the egg, lemon juice, and buttermilk and mix until a sticky dough forms. Gently knead the dough a couple times on a floured surface, then shape into a 1-inch thick circle and cut into 8 wedges. Place in a buttered scone pan or on a parchment-lined baking tray. Bake at 400 F for 15-20 minutes, until golden brown on top. Let the scones cool completely on a wire rack. 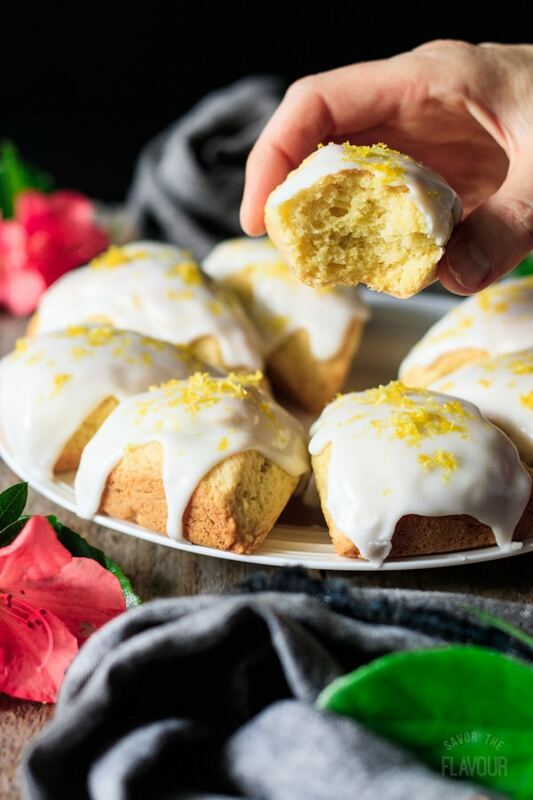 While they’re cooling, gather the glaze ingredients: icing sugar, lemon juice, and lemon zest. Sift the icing sugar into a bowl and stir in enough lemon juice to make a thick but pourable glaze. Spoon the glaze on top of the cooled scones and scatter the lemon zest on top. Let the icing set for 10-15 minutes before serving. 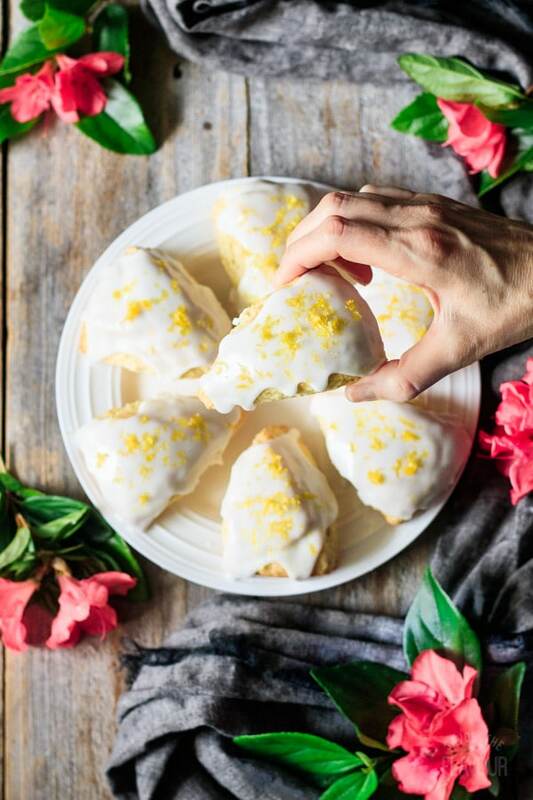 Whether you’re making these glazed lemon scones for an after-school snack or for a ladies’ spring tea, you’ll enjoy the delightful lemon flavor and the not-too-sweet scone. 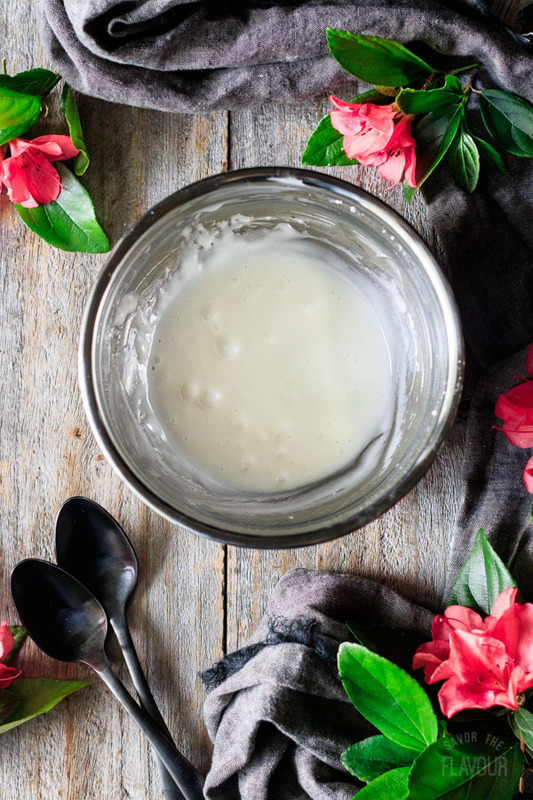 If you love lemon desserts, this is one recipe you should try this spring! Make sure the butter is cold from the fridge. 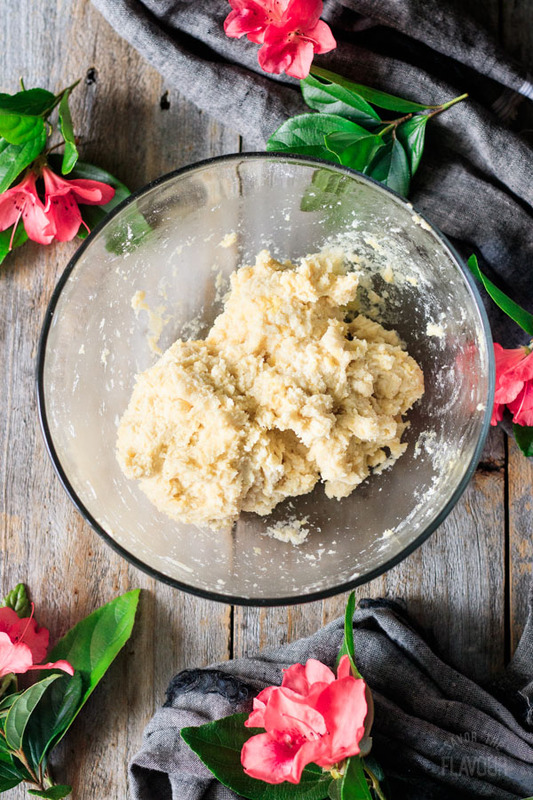 Room-temperature butter will make a greasy dough that won’t have a nice texture. Handle the scone dough gently. Overworking it will make the scones tough. Freshly squeeze the lemon juice for the scones and icing; it tastes ten times better than the bottled kind. Be careful not to overbake the scones, or they will be dry and extra crumbly. Let the scones cool completely before pouring the icing on top. Warm scones will soak up the glaze, which isn’t what we want. Have a fabulous afternoon tea party with these other treats. 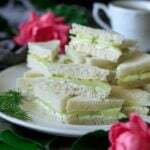 Easy Cucumber Sandwiches: a dainty appetizer made with English cucumber, dill, and cream cheese. 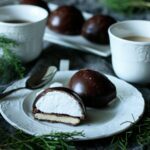 Chocolate Raspberry Teacakes: dark chocolate, homemade marshmallow, and a cookie make these morsels quite a treat. Chocolate, Cherry, and Marzipan Scones: these moist scones are made with buttermilk and crème fraîche. The pleasure of a 5-star review of these lemon scones would be greatly appreciated. Preheat the oven to 400 F. Lightly butter a ceramic scone pan or line a cookie sheet with parchment paper. Finely grate the zest of one lemon, setting aside 2 teaspoons for the decoration. 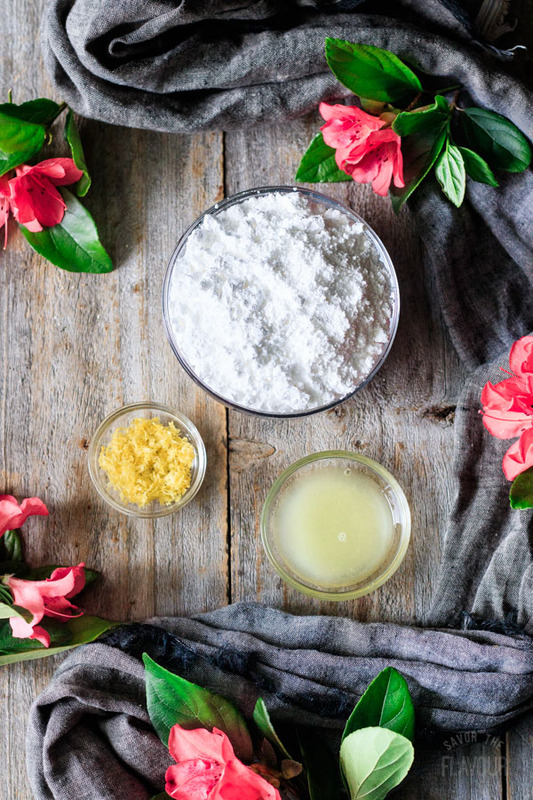 Pour the two flours into a large mixing bowl and stir in the sugar, baking powder, baking soda, salt, and lemon zest. Cube the cold butter and add it to the flour mixture. 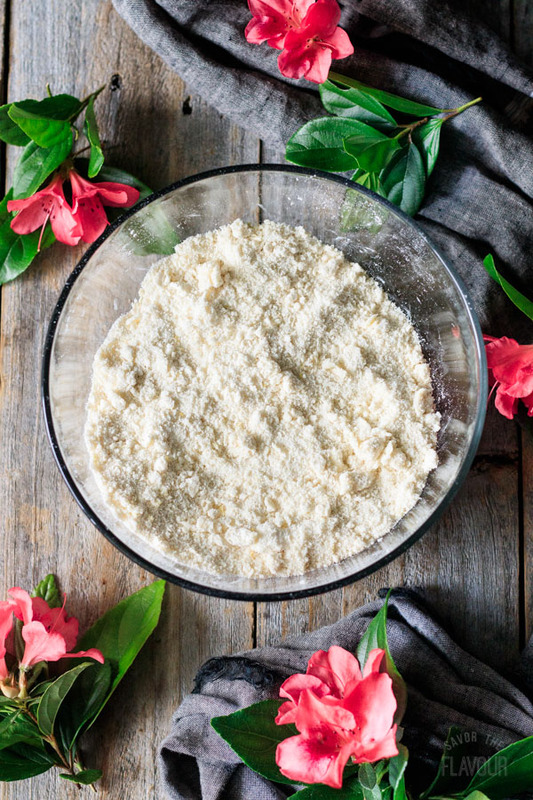 Rub the fat into the flour by pinching the cubes of butter and stirring it with the flour until the mixture looks like fine breadcrumbs. Add the egg, lemon juice, and a couple tablespoons of milk, then mix by hand to bring the dough together. Add more milk if needed to create a soft, slightly sticky dough. 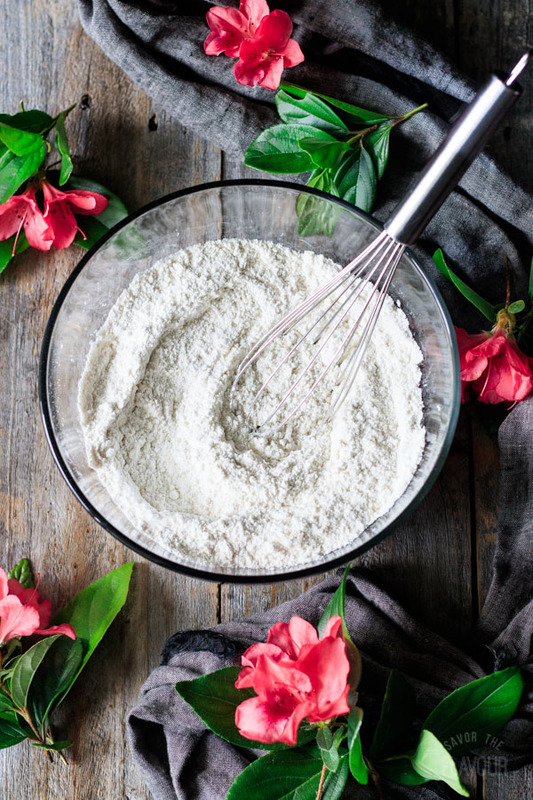 Turn the dough onto a lightly floured surface and knead gently a couple times until the dough is smooth. Shape into a disc about an inch thick and cut into eight wedges. Place each wedge in the scone pan or on the prepared cookie sheet. Brush some milk on top of each scone, then bake at 400 F for 15-20 minutes, until the scones are well risen and a light golden brown on top. Let the scones cool in the pan for 5 minutes, then allow them to finish cooling on a wire rack. While the scones are cooling, mix up the glaze. Sift the icing sugar into a medium bowl and stir in enough lemon juice to make a thick icing. Once the scones have cooled completely, dip the top of each one into the glaze and sprinkle with lemon zest. Let the icing harden before serving, about 10 minutes. Serve the scones with homemade lemon curd and crème fraîche. If you bake the scones on a metal cookie sheet, they’ll cook differently than in a ceramic scone pan. Check the scones early to make sure they don’t overbake. Love your pictures. The flowers you chose are a great addition to the pictures. I can’t wait to make the scones. They look mouth watering. Thank you for sharing your beautiful web site with us. I found it very useful. Thank you so much, Betty! The flowers are blooming beautifully in our yard–we couldn’t resist putting them in the photos! 🙂 Enjoy the recipes and the scones! I agree, Nicolas! 😊🍋☕ Thank you for your kind words.